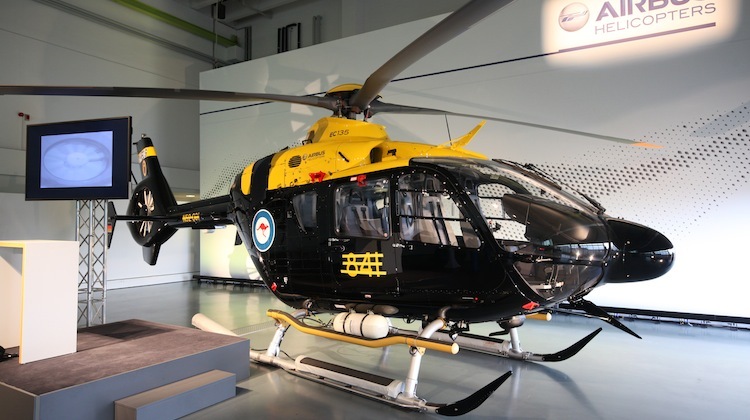 Airbus Helicopters has achieved factory acceptance of HATS01, the first of 15 EC135 T2+ helicopters destined for the Australian Defence Force (ADF) Helicopter Aircrew Training System (HATS) that will be based at HMAS Albatross. Prime contractor Boeing Defence Australia joined representatives of the Royal Australian Navy and the Australian Army for the factory acceptance ceremony at Donauwörth in Germany. “Airbus Helicopters is thrilled that Boeing and the Commonwealth of Australia have demonstrated their confidence in our product by accepting this first EC135 T2+ on time and on budget as part of a world-leading high-tech Helicopter Aircrew Training System for the ADF,” said Peter Harris, head of governmental sales for Australia and the Pacific. Following contract signature in November last year, the first aircraft took to the skies on January 16, he added. “The next steps involve training of initial Boeing and Commonwealth aircrews and technicians here in Donauwörth before shipment to Australia in January 2016,” Harris said. As for Boeing, HATS program manager James Heading said that the company’s team has been conducting engineering evaluations, and ground and flight-test activities, and is fully satisfied with the results. “By partnering with Airbus Helicopters on this important program, Boeing Defence Australia is confident of meeting our requirements towards the Commonwealth for providing a mature and cost-effective platform that meets training, technical and safety requirements, and the future needs of the Australian Defence Force,” Heading said. Airbus stated that the twin-engine EC135 T2+ offers a glass cockpit and high visibility, multi-axis autopilot, and other systems that will help instructors perform training missions safely while providing the ADF with the flexibility to undertake additional missions as required. What was the date of the the Factory Acceptance? Didn’t spot it in the article – but my eyes aren’t what they used to be! If they are leased – there will probably be some conditions restricting/precluding landings/deployment aboard boats (much like the A109 and Bell 429 leased previously which never touched a deck), probably also preclude aerobatics so no Navy Squirrels pair like demos – I hope I am wrong though! No wheels either on these – all frontline/planned ADF vertols currently have wheels…. thats simulator progress for you….